Your body needs biotin, sometimes called vitamin B7 or vitamin H, for energy production, and it is also essential for healthy nails, hair and skin. Cooked eggs, particularly the yolks, are excellent sources of this vitamin. However, raw egg whites contain a protein that can actually interfere with your body's ability to make use of biotin. Talk to your doctor about how much biotin you need, as well as how to make eggs a part of your diet. Healthy adults need 30 micrograms of biotin a day, according to the University of Maryland Medical Center. 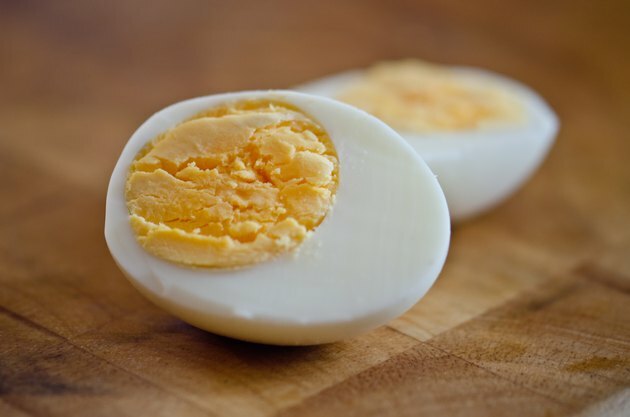 A single boiled egg contains 25 micrograms of biotin, so eating one can put you well on your way to meeting the recommended dietary allowance, or RDA. To add variety to your egg dish, try eating it fried or poached instead of boiled, and you will still get 25 micrograms of biotin. You could also try making an omelet, which contains 22 micrograms of biotin. Raw egg whites contain a protein known as avidin, which binds with biotin in your intestines and prevents your body from using it. Therefore, if you eat two or more raw egg whites a day for several months, it is possible that you will develop a biotin deficiency. While this condition is rare, symptoms of a biotin deficiency include hair loss, scaly skin and insomnia. Cook your egg whites thoroughly to help prevent a deficiency, and be sure to meet the RDA of biotin daily. While eggs can be a healthy part of a balanced diet, they are also high in cholesterol: one large egg contains roughly 213 milligrams of cholesterol. Healthy people should not consume more than 300 milligrams of cholesterol a day, and those with heart disease or certain other conditions may need to further limit their intake to less than 200 milligrams a day. If you want to get your biotin from eggs, limit other cholesterol-containing foods throughout the day to keep your intake in check. Many other foods are good sources of biotin, such as brewer's yeast, sardines, pecans, whole grains, bananas and cauliflower. Try getting your biotin from these items on occasion to avoid eating eggs every day, particularly if you have high cholesterol. Always discuss dietary changes with your doctor, especially if you have health conditions or concerns. If you suspect you may not be getting enough biotin, see your doctor. Are There Side Effects of Egg Whites? What Are the Benefits of Duck Eggs?